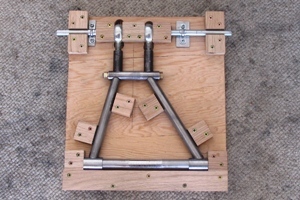 We just finished putting together our third and greatest upper control arm jig. No matter how much we tweaked the old one, it was a disappointment. The inner and outer alignment rods, which should be exactly parallel, were off by 1/32” at one end, and the bushing tubes were a full 1/16” too close together. No excuse for such sloppiness, but maybe we were too impatient. So I guess there is an excuse. But in any case the jig was also getting very chopped up, with the alignment blocks starting to crowd the welding area. Add to that our unfortunate limited camber adjustment, and it was time for a change. The new jig looks a lot like the old one, but don't be confused. This one is accurate to 0.01”, allows ample room for welding, and is much cleaner to boot. The distance between the inner and outer bushing tubes is 9-5/16” exactly, which is close to the right amount and more importantly it's the same on both sides. We have 12 threads showing on the rod ends now, and we didn't have to shave the threaded tubes at all. So we can now adjust the camber to -2 degrees even with jam nuts installed! Yes, we know, it's pretty exciting. We're excited about it, too. Unfortunately our two upper control arm tubes didn't fit the new jig. They had to be shortened slightly. We're getting better at this, although it still takes a long time because fitting one end of a round tube to the side of another round tube requires fabrication skills that most people, including us, are not born with. And while there are tools for this, we don't have them. In any case we're happy with the fit so far, although we should know more about that as soon as we figure out who's going to weld these things together. We're glad we caught these discrepancies now, before things got out of hand. When we first started this project we hoped to be a lot more diligent. Our original design goals for the Locost included 1/32" accuracy on everything, and we actually think we achieved that on the frame tubes, or at least on most of them, at least until we try welding them together. But now, after working on the control arm jigs, we believe it's actually possible to do even better than that, based on the following reasoning. It's no big deal to measure something to the nearest 1/32". You can get rulers with marks that close together, so it's easy. If you have a ruler like that, you can actually measure something to the nearest 0.01", because that's a full third of the space between two 1/32" marks on the ruler. And you can judge that easily. You can tell, for instance, if the end of the tube is exactly on the ruler line, or maybe a third of the way to the next line, or two-thirds of the way to the next line. Which is awesome. We're not sure that 0.01" accuracy is required for everything. You can probably allow more tolerance than that on things like the glove box. On the other hand it can't hurt. So keep this in mind the next time you're building a Locost. It's too late for us of course, we'll have to live with our giant 1/32" tolerances, but we're pretty sure you can do better. Ft8TvS Great article.Much thanks again. Awesome.